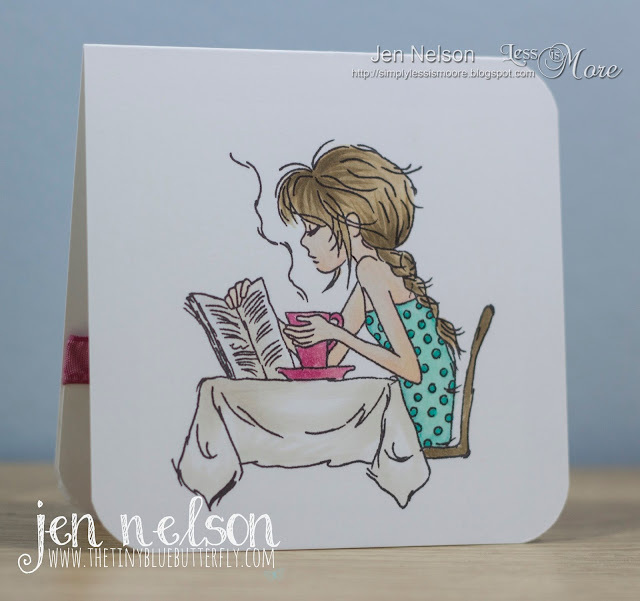 Morning .... Today I have my card for the new Less Is More challenge. It's One Layer week and the theme is Favourite Drink... Difficult one for me as I am pretty much only drinking H2O at the moment. I ended up using this fabulous stamp from Lili Of The Valley to make a little card with a surprise inside! 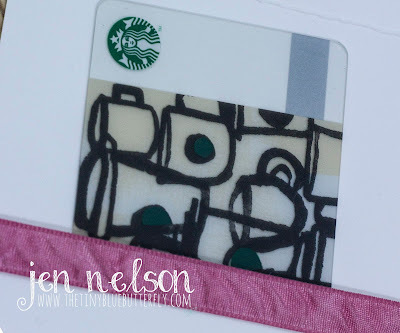 A Starbuck gift card is hidden inside, perfect for those true coffee lovers! I'm still working through the craft room and haven't had much time for it this last week so the desk os pretty much covered in stuff and everything is lying around. My mojo is also lost in there as well as I am really struggling to sit down and create anything ... overload of new stuff (the SU order I placed last week as not helped in that). Your card is sweet. Good luck with cleaning off your desk...but I guess the good news is that you have lots of new stuff to play with! I love this image! I disagree with you losing your mojo as I think this is a wonderful card! I love it!! That's a gorgeous image Jen and beautifully coloured. Doesn't appear to be much wrong with your mojo from where I'm looking but hope it comes back soon. Love your card Jen ! It looks like you had a picture of my daughter taking breakfast (hot chocolate instead of coffee !) and reading her book, forgetting everything that happens around ! Your colouring is fabulous ! Good luck for organising your craft room, I know what you are talking about since mine is upside down ! What a fab card Jen! I love the surprise gift card, and that image is adorable. Hope the craft room is back to rights soon. I know what you mean... I find it so hard to create when things are in chaos! Good luck!